I'd like to convert many WAV files to MP3 files using LAME and Automator. I need a script that I could right click a folder and convert all the WAV files inside the folder to MP3 files. I've been able to find a script to convert single file but I don't know how to modify it so I could convert many files with a single click. I've been using script which I found here for single files. Here is a similar question but instead of using "Run Applescript" it uses "Run Shell Script". I've tried to replace LAME parameters between "do" and "done" but haven't succeeded to convert anything. So, how could I convert folder full of WAV files to MP3 files? For me it doesn't matter is it done by using Applescript or Shell Script in Automator if both ways are possible. Automator 'hangs' when attempting to use LAME encoder unfortunately. It's also not efficient or advisable to try and use a multi-threaded process as an Automator Service. For tasks such as this it's best to either run a simple script or use an alternate method. Of course, you would change -V 0 -q 0 to whatever lame options you prefer. If you want to be notified when it's done, you can add a say command, use a "Show Growl Notification" action (if you have Growl installed), or use a beep command in a "Run AppleScript" action. 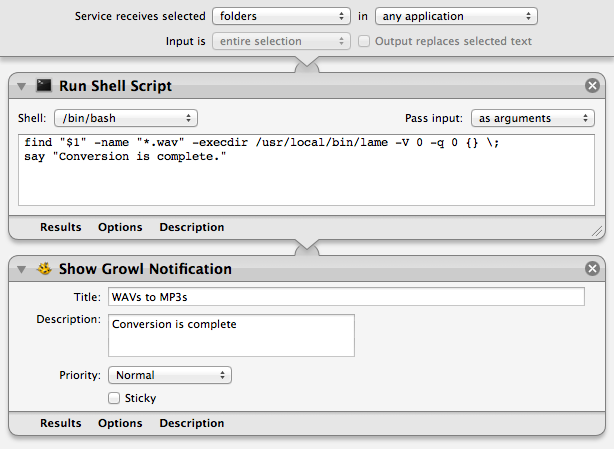 Below is a screenshot of what my workflow looks like with the extra say command and the Growl notification. Also notice I changed the "Service receives selected" option at the top to "folders" (it will be "text" by default). Not the answer you're looking for? Browse other questions tagged automator mp3 file-conversion encoding . Converting Audio to AC-3 using afconvert? How can I make an Automator service run a Terminal and display the output?